There's a lot of vacant space at Ubisoft's new Toronto studios - two huge rooms, not counting the many empty desks in the main space of this latest branch of the Paris-based videogame giant. 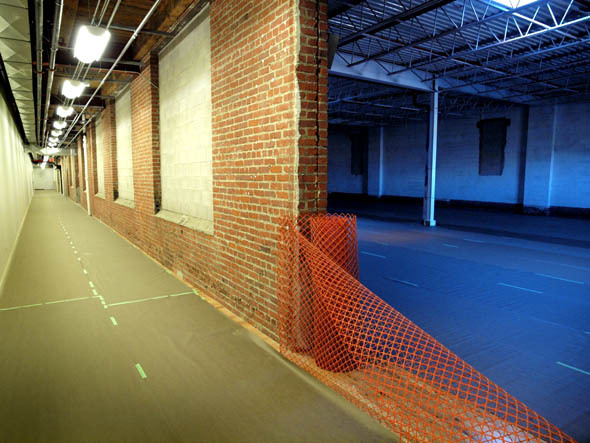 At the launch party just over a month ago, one of the empty rooms was used for a free-for-all game of digital paintball, but right now it's dark and silent, the new floor covered up, waiting for employees yet to be hired. 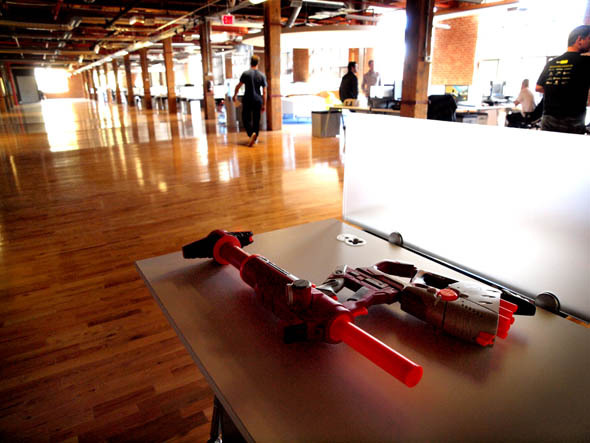 Ubisoft's Toronto studio has taken a whole floor in what was once part of the massive General Electric complex in the Junction Triangle. An iconic water tower looms over the building, where a core of around 60 employees are hard at work on what will be the latest installment of Ubisoft's lucrative Splinter Cell series, along with another mystery project, the details of which I'm told is strictly under wraps. Alexandre Parizeau, the project's producer, and Maxime Béland, creative director, are showing me around the space; in the big boardroom behind the reception area and brand new cafeteria, they chuckle that the big, expensive teleconferencing system used to communicate with the Paris head office isn't usually up to its transatlantic duties, and they've come to rely on a laptop and a $30 quickcam to do the job. Ubisoft has studios in 17 countries - four in Canada with Toronto joining one in Vancouver and two in Quebec. 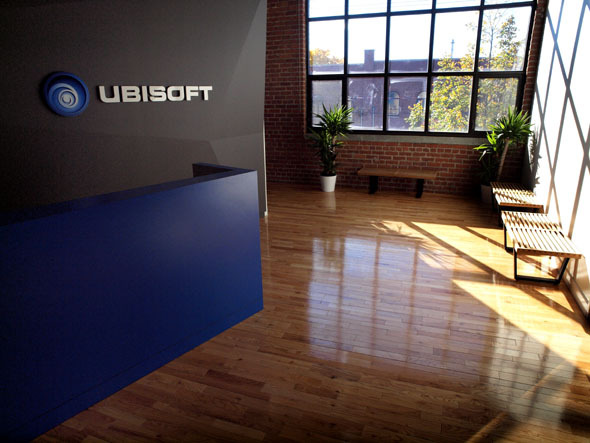 Parizeau and Béland have come here from the Montreal branch, and say that a lot of thought went into choosing the location of the new studio, which they say compares very nicely with Ubisoft's facility in the immensely fashionable Mile-End neighbourhood. "We wanted to open in an area that's growing, where there's a lot of activity, to grow with the neighbourhood," says Parizeau. "We get a bit of that feeling already here - there are restaurants opening. You get a feeling that there's going to be an interaction with the area growing and the studio growing at the same time. It's a nice feel." "Like Montreal, it's an area with a lot of artists," adds Béland. "It's not like downtown, with big buildings and skyscrapers. It's not as corporate. You feel the artists that are living around you." There were a lot of reasons to open a new studio in Toronto, prime among them the ability to recruit employees from schools like Sheridan and the University of Waterloo, whose computer science and digital animation programs are fertile training grounds for the skills needed to produce videogames in an ever more competitive market. 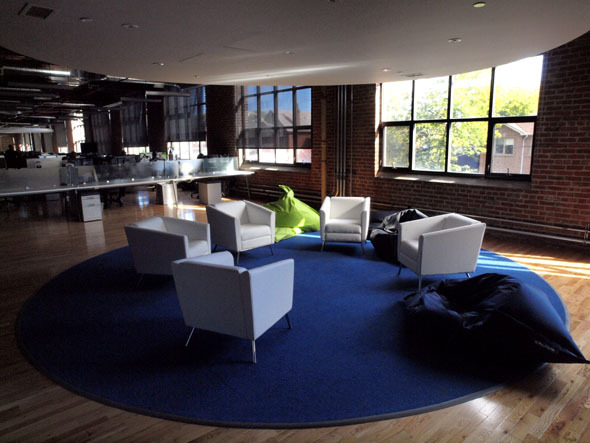 The long-term plan for the Toronto studio is to fill the three huge rooms with up to 800 employees in ten years, which is probably why the space feels so empty today with barely sixty. "I'm interviewing a sound designer today," Béland says. 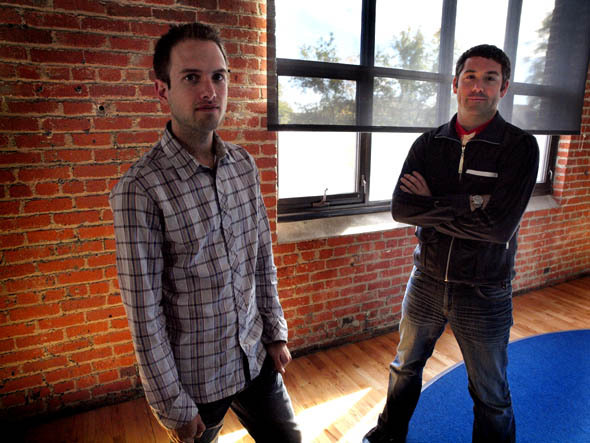 "We need people to do sound and music, and I'm interviewing a game designer. Just in programming there's different specialties - you have network programmers and sound programmers, 3-D programmers, physics programmers, which is probably the hardest position to fill. And after that there's the whole artistic side, so you've got animation, 3-D modeling, texture artists, lighting artists, concept artists, storyboard artists. That's what I like about videogames." "What we're trying to do right now is focus on a big brand that's well known but it's ambitious," Parizeau says, explaining why Ubisoft is basing the Toronto studio around the project currently known as Splinter Cell 6. "It's an old brand that's been with Ubisoft for a long time, and that's why we decided to start a studio with this particular brand, so we can attract the senior talent we need to grow the studio. That's the key idea behind the studio here. Videogames are all about the talent, the people you work with. We need to build a team of strong, senior individuals so we can build the studio around them and help other people learn the trade." An additional attraction Toronto offers, they say, is our film and TV production industry, which provides vital expertise and acting talent as the videogame medium becomes ever more cinematic. Béland and Parizeau have already discovered other benefits to working in Toronto, such as flying out of a hub airport and skipping the gruelling stopovers they've endured on visits to Ubisoft studios in the U.S. and Asia. "The other day I flew Virgin for the first time," Béland says," and I was like - yes!"